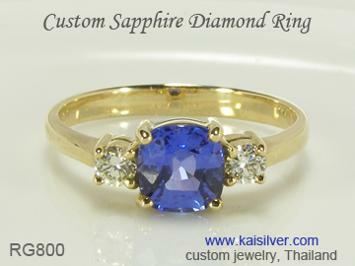 Men's Sapphire Ring From Kaisilver, MAN135 Gold Or 925 Silver Men's Ring. The MAN135 men's sapphire ring with diamonds, has been designed and crafted to impress the seasoned jewelry lover. We have compromised on nothing and ensured that this men's diamond and gemstone ring delivers style, durability and true value. In ancient times it was believed that sapphires were always blue, people would often refer to every blue stone as a 'sapphire'. Science has today enlightened us with a range of sapphire colors which include, blue, green, orange, white, yellow, pink and even purple. Don't forget that each of these colors boasts of a range of shades - the gem is one of nature's most spectacular creations. We have picked the most popular sapphire colore for this men's sapphire gemstone ring. An oval 9x7mm blue sapphire gem is firmly set in the center of this gold or 925 silver ring. Since we do not place any limitation on gem selection, you could request for a sapphire that is not blue perhaps, orange, green or even deep pink. Blue sapphire has always been highly respected, in the old days the gem was often reserved for aristocrats and royals. A gem with tremendous tradition and folklore like sapphire is understandably always in demand. Sapphire has always maintained a high price point, its beauty and rarity never cease to please fine jewelry lovers. Blue sapphire has received tremendous exposure in recent times. The British Royals have not once but twice, chosen this gorgeous gem to celebrate very important events. The almost fairy tale like affair between Lady Diana and Prince Charles, was sealed with a stunning sapphire and diamond engagement ring worn by Princess Diana. Decades later when Prince William the son of late Lady Diana got engaged to Kate Middleton, the young man chose a blue sapphire diamond ring for Kate. Interestingly the stunning blue sapphire gem in the ring, was the same gem that graced the ring that Prince Charles gave Lady Diana to mark their engagement. The MAN135 men's blue sapphire ring has a handpicked 9x7mm oval blue sapphire gemstone. This is a natural gem and not synthetic. The center sapphire gem is surrounded by 2mm round gems, we provide options for diamonds, rubies and sapphires. While we can technically set any other gem around the center sapphire, we recommend diamonds, rubies and sapphires as these gems are very hard and durable. It is a good idea to discuss your requirements with our support team, a well informed purchase is good for both you and us. The MAN135 men's ring is designed and crafted to look good and be long lasting. In the center is a 9x7mm oval gem which is surrounded by 2mm round gemstones. 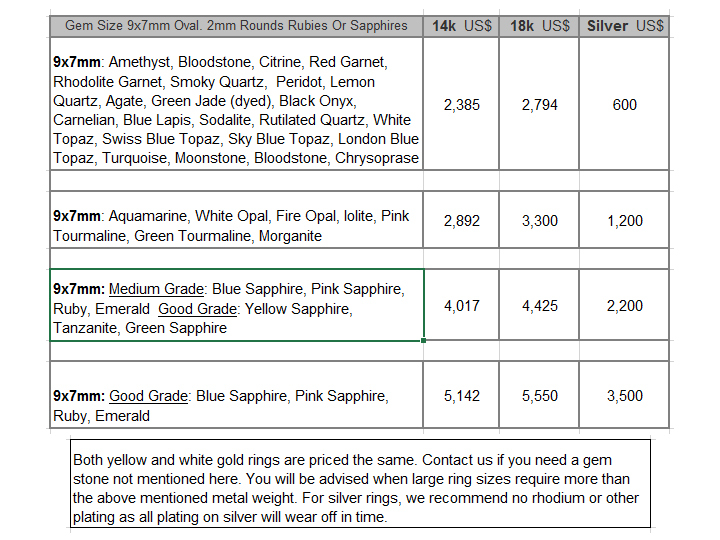 The sapphire gem will be a natural gemstone, check the price tables for more information. Choose 2mm round diamonds or, 2mm sapphires / rubies for the surrounding gems. The 2mm diamonds are graded VS2 with G-H color, diamond weight is 0.4o carats. You get the same quality standards for workmanship and gems for the gold or silver ring. We recommend no plating for the silver ring as no plating on silver lasts permanently. The men's sapphire gold ring has a weight of around 22 to 25 grams. Silver sapphire rings for men have a weight of around 20-22 grams. Larger ring sizes might require more metal weight, our experts will keep you informed. The men's sapphire gold ring is available in 14k or 18k gold and three gold colors. You can request for a price quote if you prefer to have a 10k men's sapphire ring. 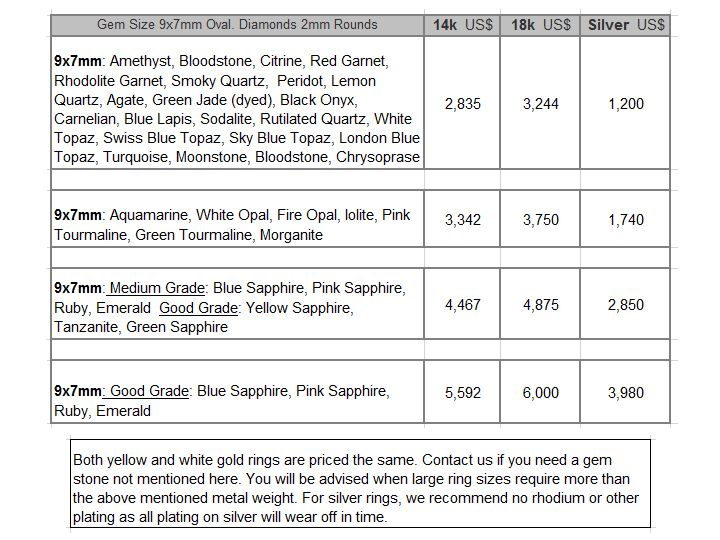 We can work with your design or ours, we place no restriction on gem selection. Each men's 925 silver or gold ring is fully custom made in all ring sizes. Customization: For over a decade, Kaisilver custom made jewelry has earned the respect and appreciation of knowledgeable gem and jewelry lovers across the globe. Widely accepted as the leading online fine jewelry provider, we have today become synonymous with quality and durability. Your sapphire men's ring can be crafted with the design of your choice, the designs from our website can also be modified to suit your requirements. A team of highly skilled artisans, gem experts and trained quality control personnel work on all gold and sterling silver jewelry that we make. Do get in touch with the support team at sales@kaisilver.com for any, questions or requirements that you might have. How To Buy: We prefer not to fill our website with 'Buy Now' and 'Checkout' buttons, fine jewelry like that crafted by Kaisilver requires more interaction. Your men's blue sapphire ring can be crafted in gold or 925 silver with, no limitation on design, dimensions or gemstone. This unmatched customization that we provide, works best if you convey your requirements and questions to our support experts at sales@kaisilver.com The team will get back to you with complete details, you will never be under an obligation to buy anything from us. We accept payment through Paypal and Western Union, we recommend Paypal for first time buyers. You can let us know which mode of payment you prefer and we will provide details for the same. Options for other modes of payment are best discussed on a case by case basis. We generally add a flat 45 U.$ shipping charge across the globe, shipment is done through FEDEX with web tracking. A handsome men's sapphire ring, the ring is shown here with rubelite gems on the side but, you can request for the gemstones of your choice. Learn more about this Kaisilver men's ring ... here. An absolutely stunning blue sapphire diamond ring, available in white, yellow or rose gold. 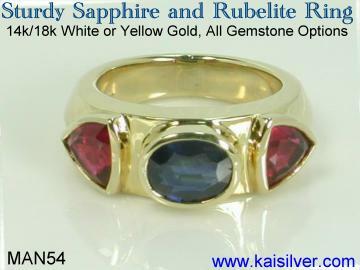 You can order your RG800 sapphire gemstone ring in gold or sterling silver. Read all about this fine ring ... here.